One of the best ways to keep slugs and snails out of garden beds is by using a slug fence. Slug fences guarantee non-violent protection and once installed, plants are safe. At least, that’s what the manufacturers promise. However, the effectiveness of slug and snail fences is controversial. The term “slug fence” refers to many different products, and not all of them do what they promise. This has led to a lot of confusion. Here, you will find what you need to know so you can choose and build a fence that works for your garden. Find a slug fence for your garden. 2.1 Do Slug Fences with Bent Edges Work? 2.2 Mechanical Slug and Snail Fences: Metal or Plastic? Metal fences are probably the most useful long-term measure against slugs. This is due to their special bent edge, which neither slugs nor snails can overcome. Because metal is expensive, some manufacturers offer a cheaper plastic version of the metal fences. One version comes as a roll and also works pretty well. However, this variant has a weak point: there are no corner connectors available, as are provided for metal fences. Copper can be easily installed around raised beds, pails or tubs to make them snail-proof. About 80% or 90% of slugs and snails are deterred by copper, but these fences do not bring 100% safety. Unlike metal and plastic slug fences, these copper barriers are often made out of wire mesh or tape. More information about how to use copper effectively against slugs can be found here. In addition to these copper fences, there are wire mesh slug fences made of other metals. Further, there are also a number of plastic fence variants, which have inconsistent quality and are unlikely to work. 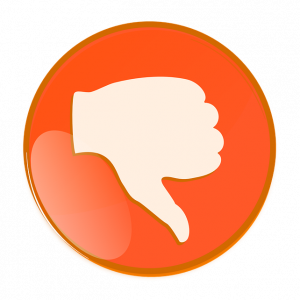 Although there are positive reports about these fences, contrary reviews also are piling up. Therefore, care should be taken when purchasing plastic fences to avoid disappointment. Another possibility is to use an electric fence to deter snails and slugs. You can find more information about how to use electric fences against snails here. 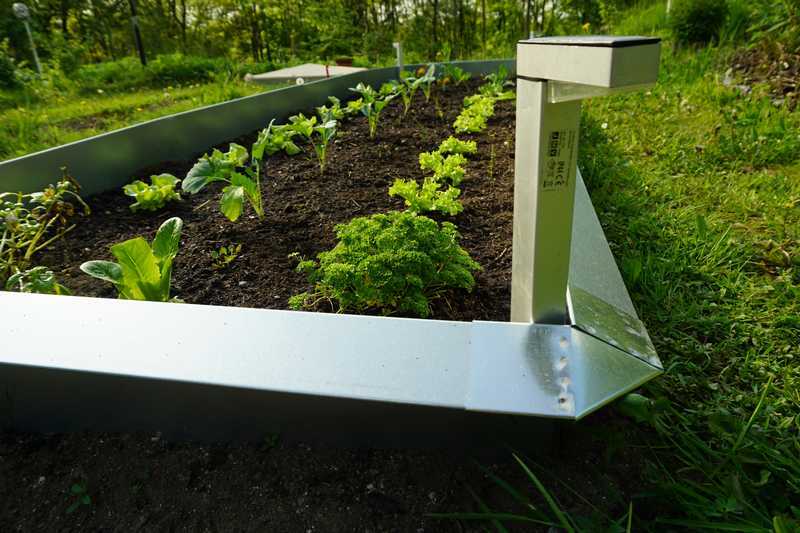 This bent edge repels slugs and snails without chemicals. In the following section, mechanical slug fences and their installation are described in greater detail. Sometimes these fences are called the ‘Hanover slug fence’. Do Slug Fences with Bent Edges Work? The effectiveness of slug fences with protective edges is sometimes called into question. 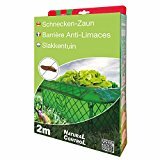 I wanted to be sure of their quality before recommending them, so I conducted an experiment to test how well these fences keep slugs and snails out. I have also put these fences to a long-term test and set up trial beds for this purpose. Long-term testing area: The tiny plants from the above picture were able to grow undisturbed. First, I constructed a barrier out of a bent plastic fence. Then, I put freshly collected slugs and snails inside the barrier and observed what happened. The following video shows the implementation and test procedure. In the video, you can see what happens to the slugs and snails when they come into contact with the angled edge. You can find more information about the slug fence test experiment here. Mechanical Slug and Snail Fences: Metal or Plastic? The classic slug fence is made of galvanized sheet steel and has been used in Germany with excellent results for many years. The metal is protected from rust by its zinc coating, and it lasts for many years. The shape of its special edge prevents snails from crossing the fence. Slugs and snails may climb upright walls without hesitation, but they get irritated when they encounter an edge. As seen in the video, they stop and turn around when they reach an angle. A corner connector for a metal slug fence. Standard corners are 90°, but 135° and 270° corners are also available. Once the fence has been assembled, there is (almost) nothing left to do. 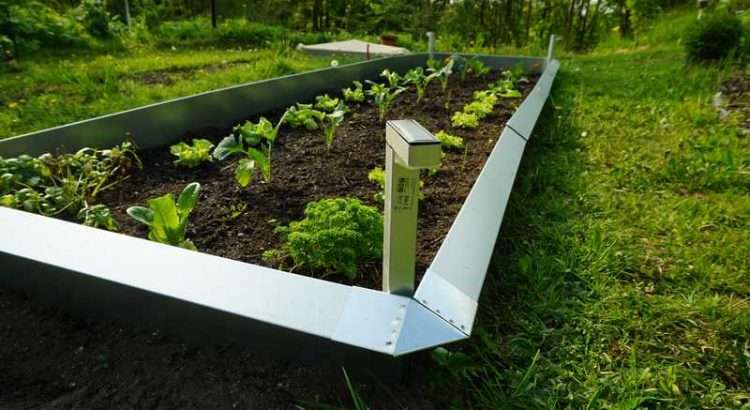 The fence repels snails without chemicals or pesticides thanks to its design. Since the fences do not rust, they last for a very long time. Therefore, they make sense from an economical and an ecological point of view. For all these reasons, I recommend metal mechanical fences as an effective way to protect vegetables and flowers. Similar to these metal fences, there is also much cheaper variant made of transparent plastic (as seen in the video). However, the plastic does not last as long and is not quite as effective as the metal version. The main problem of plastic fences is that there are no corner connectors, which leads to additional problems. More information on this will be provided later. Installing the fence is simple, self-explanatory and quickly done. 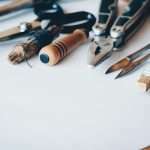 Nevertheless, there are some things to keep in mind before, during, and after the installation. First, measure the area you would like to protect. You should know roughly how many meters of fence and how many corners you need before buying them. For the installation itself, you only need a spade, work gloves, and, if you’d like, a spirit level. You can install the fence alone without any problems, but it is easier and more fun with a second pair of hands. The fence can be installed in an uneven area, but it will be a little more difficult. It may also be helpful to level out uneven ground beforehand and order a 10-inch (or 25-centimeter) fence to compensate for level differences. On level ground, an 8-inch (20-cm) metal or plastic fence is probably sufficient. You can use a spade to prepare the ground around your bed. To begin, it may also be useful to mark a straight line around the bed beforehand. This makes it easier to install the fences in a straight and accurate position. For smaller beds, this might not be necessary. 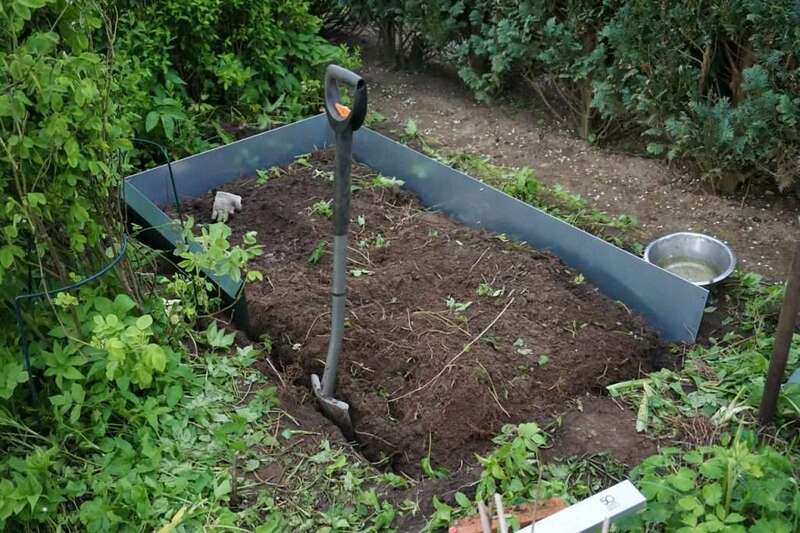 Then it is best to use a spade to make narrow, flat slits around the area of your bed, as seen in the picture.The fence elements can easily be placed and connected to each other in these slits. Put the fence elements and corners together. They either slide into each other or screw together depending on the model and manufacturer.Try not to leave open slits in the corners, which small slugs could squeeze through. When the elements are connected, it might be necessary to compensate for height differences using a spirit level. The fence should protrude between 4 and 6 inches (10 and 15 cm) from the ground. At the same time it should be buried about 4 inches (10 cm) into the ground so the fence can stand securely. After this, fill the slots and ditches with earth. Make sure the earth is packed firmly on the inside and outside to give the fence enough stability. 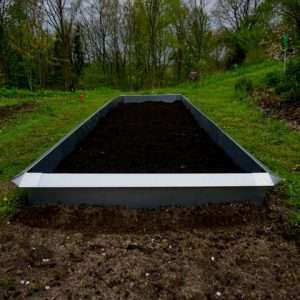 The resulting bed can be filled with compost, manure, and topsoil as desired. 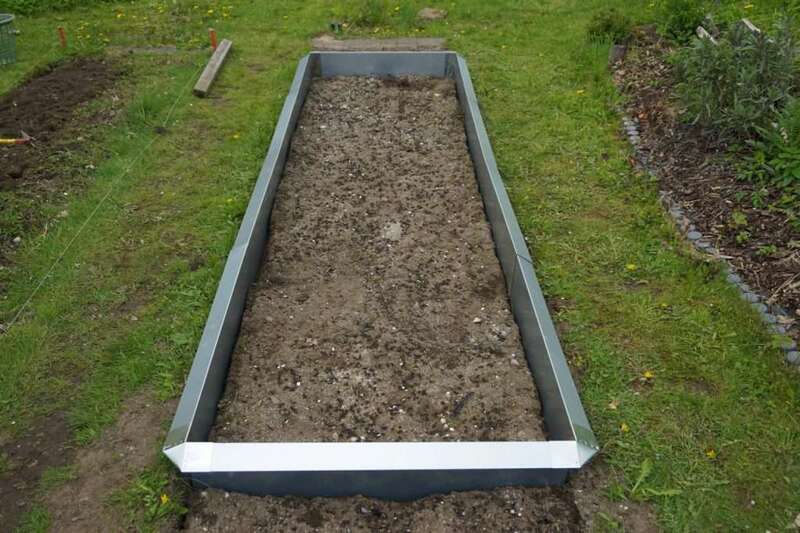 In this way, slug fences can be used to create a small raised bed. You can fill the inside of a slug fence with compost. Plastic fences are made of PET plastic, which is weather- and UV-resistant. The fence is 8 inches (20 cm) high, and the available rolls are around 9 yards (8 meters) in length. After you have bent the 2-inch (5-cm) edge, the height of the fence is about 6 inches (15 cm). This is a bit too short for the fence to remain stable without going below the necessary height. Therefore, I recommend nailing or otherwise attaching the fence to a wooden plank or other suitable material. 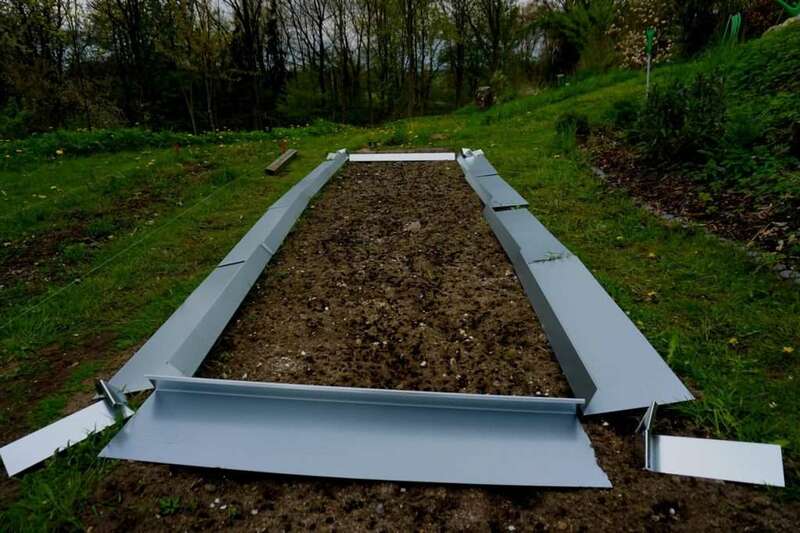 With this attachment, you will have enough room to anchor the fence in the ground and be able to give the fence more stability. Thus, the set-up of a plastic slug fence requires some additional manual skills. However, there are helpful guides included with your order, and there is a video that explains the basic steps. 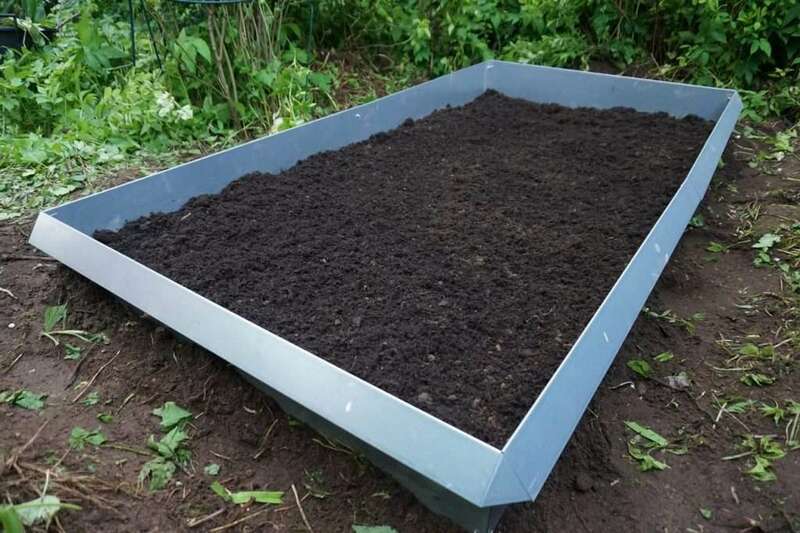 The following video shows how the fence is set up as a slug control method for a raised bed. It demonstrates how the fence’s corners are created—which is a bit tricky—and how it looks in the end. You can see, the installation of plastic fences is more complicated than that of metal fences. However, the video shows that installation is not too complicated once you understand the procedure. The biggest problem with this set-up is that the 90° edge might not be very effective, as one of my slug fence experiments indicated. You can find more information about this snail and slug fence test here. Because of this problem, metal fences are generally more effective. Nonetheless, plastic fences are able to stop at least some slugs and snails. For handy people, it might even be possible to find a solution for the problem with the corners. For example you could combine the plastic fence with the metal corner connectors. Cut the grass around the fence regularly. 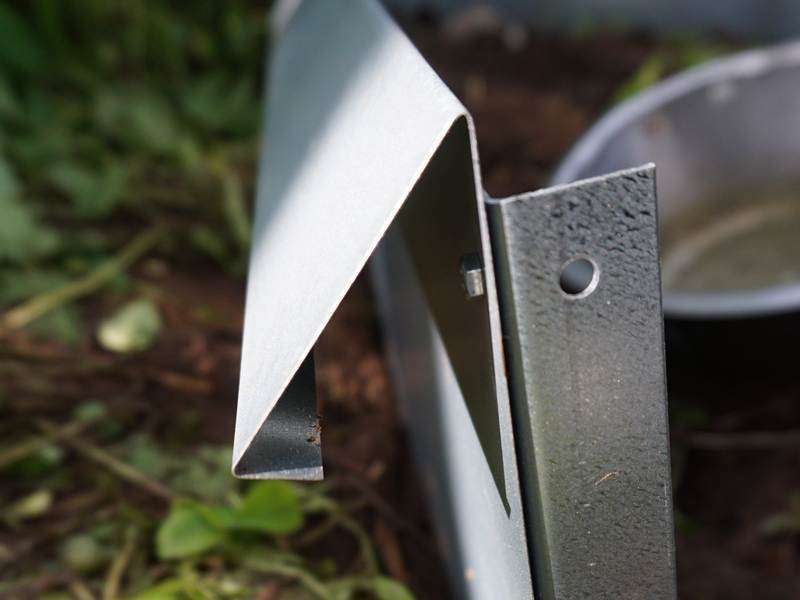 Once you have finished installing a plastic or metal fence, you should regularly check that growing plants are not are not acting as bridges into the garden. Some slugs and snails will take this as an opportunity to invade your salad greens. Therefore, it may be helpful to put mulch around the fence. You can also create a surrounding strip with tiles, stones or wooden planks. After you have set up the fence and surrounding strip, make sure to carefully remove all snails and slugs from the inner area. This can be achieved by either collecting them manually or, more easily, with the help of a snail trap. Note: please do not use beer traps because they attract slugs from a distance. You can find more info about beer traps here. There are also snail traps that can be used to catch slugs and snails alive. 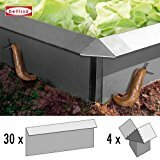 Find out how to trap slugs here. Finally, you should be careful when introducing new plants, soil or compost into the fenced area. When doing this, you might reintroduce slugs or their eggs, which often hide inside soil or potted plants. Though slug fences are often a good solution, they do have their drawbacks. Metal slug fences are not cheap and are often not affordable for gardeners with small budgets. They only pay off if you plan to use them for many years. Plastic fences, on the other hand, are cheap, but they can be a bit unstable and difficult to set up. Furthermore, they are only 6 inches (15 cm) high, which could be too short for uneven ground. Because of this, gardeners need some improvisation skills to stabilize plastic fences. This makes installation even more complicated. 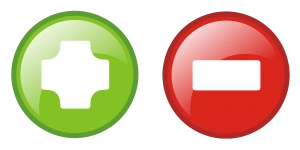 Moreover, metal or plastic may be an unwanted sight in a garden for some people. Unfortunately, there are currently no effective slug fences made of wood. These fences can also become tripping hazards, as they are obstacles not only for snails but for gardeners as well! The main advantage of slug fences is their effectiveness. Galvanized metal slug fences provide secure and long-lasting protection against slugs and snails. 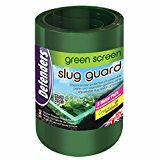 They are proven to be effective and are one of the best environmentally friendly choices to protect plants against slugs. After the set-up is finished, there is hardly any maintenance required, and no additional costs will occur. In fact, the longer a snail fence stands in a garden, the more profitable it becomes. This is certainly true compared to methods which need additional effort. Unlike slug fences, methods like slug baits, traps, and pellets lead to further costs or work. Slug fences also act as lawn edging, a pleasant side effect. 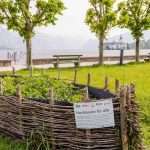 In spring—when plants are small and it is still cold outside—the fenced bed can be easily protected with a garden fleece. As a result, beds with young seedlings will also be protected against flying seeds, birds and frost. 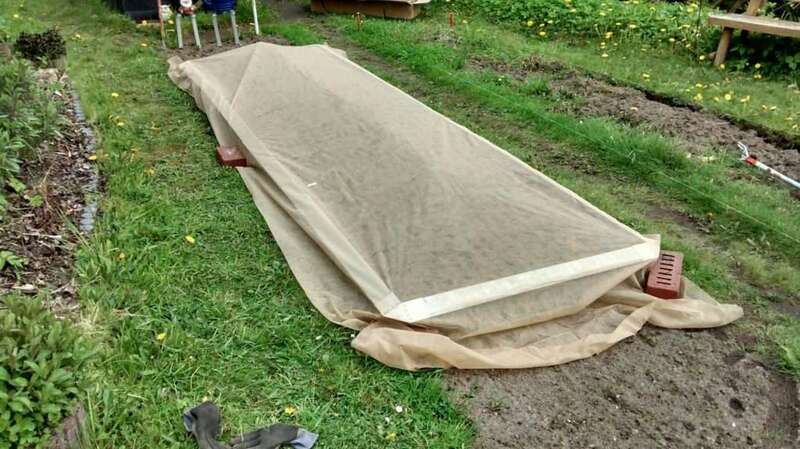 The covered slug fence can become a cold frame. A mechanical slug fence is, for many gardens, a reasonable and appropriate solution to end problems with slugs and snails. For those who are looking for a long-term and sustainable solution, slug fences may be just the right remedy. Though the initial purchase cost is high, slug fences provide a good return in the long run. The only work that remains is the removal of plant “bridges” every now and then. Therefore, the cost of the structure results in less stress and more enjoyable gardening. 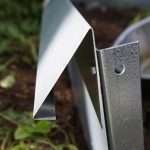 With this in mind, I recommend buying a slug fence starter set with 8 to 12 side elements and 4 corner sections. You can check out the functionality of slug fences with this set, and extending the fence with extra elements is easy. 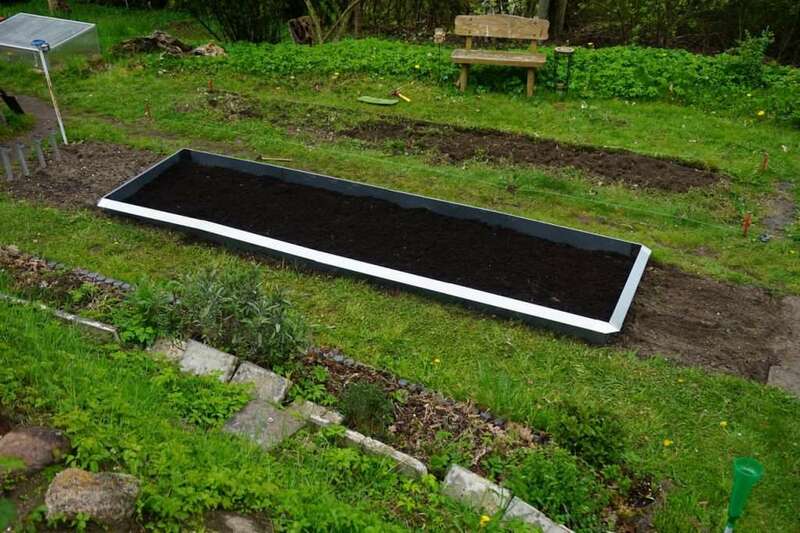 With these basic packages, you will be able to secure a large salad or vegetable bed. A starter set with 10 side elements and 4 corners–as seen in the above picture–costs between 70 and 90 dollars/pounds/euros plus shipment. Whatever brand you buy, snail fences will protect your garden for years to come. Metal slug fences are available on eBay and Amazon. The bestseller for snail fences is the company Lust, which invented this type of metal snail defense some 30 years ago. They also offer a decorative green variant, which is more attractive than the silver version. The fences created by Lust were so successful that their design was copied by many other suppliers. 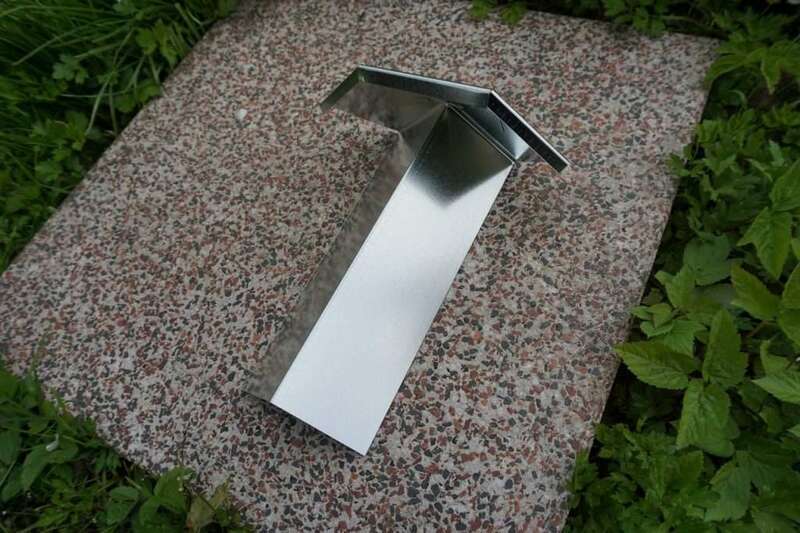 They are manufactured and delivered in one yard (meter) elements/sections. 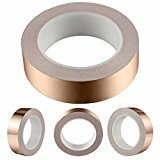 Costs per yard (meter) depend on the manufacturer and vary between 5 and 7$/₤/€. The corner connectors cost between 4 and 8$/₤/€ depending on the version. Standard corners have 90°, 135°, and 270° angles. 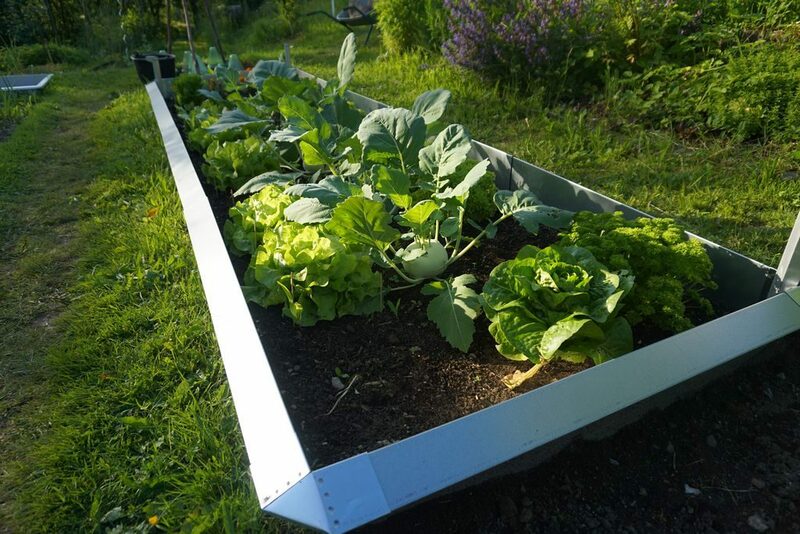 This allows gardeners to build many different bed shapes. Round and oval slug fences are not yet available. The cost can vary greatly depending on the size of the terrain or bed in need of protection. Generally speaking, square surfaces are cheaper than elongated strips. A square bed of about 100 sq yds (~100m²) can be protected for about 240$/₤/€ with 40 fence elements and 4 corner elements. That makes the cost about 2.40$/₤/€ per sq yd (~m²). For small beds or elongated strips, the price per sq yd (m²) increases. A beginner set for one sq yd (~m²) costs about 40-80 $/₤/€. Therefore, I recommend working with large, square areas to lower the price. Wide rectangles are okay, too. As a rule, the larger and squarer the fenced area, the lower the price per sq yd (~m²). The effectiveness of plastic fences can be enhanced with Schnexagon, an organic anti-slug coating. Those who still do not entirely trust slug fences paint them with a slug deterring paint called Schnexagon. If it is painted underneath the edge of the fence, this coating will be protected from the sun and rainwater. Because of this, it might last for a whole garden season. You can find more information about slug-repellent paint here. 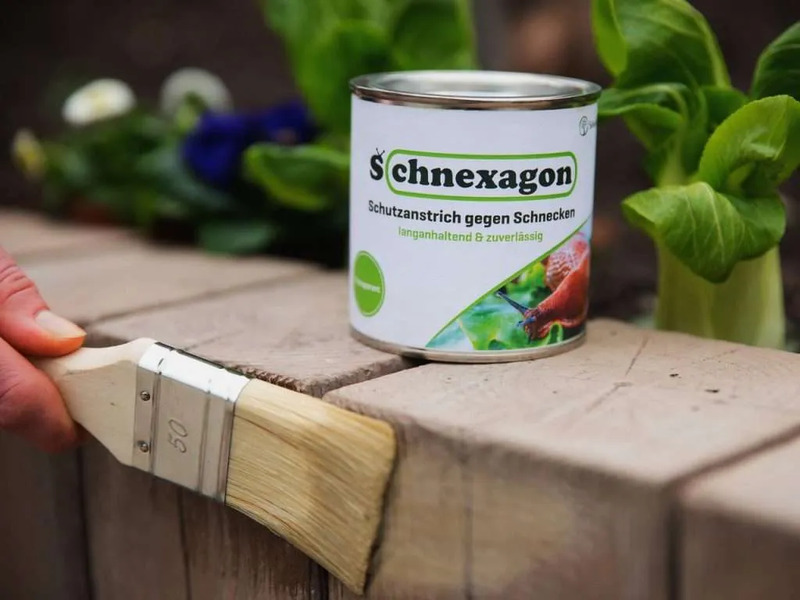 When using plastic slug fences or slug collars, I recommend using Schnexagon as well, as their edges are not 100% effective against slugs and snails. This coating is not necessary if you use metal fences, as they are safe enough on their own. Whether you decide to use a slug fence or not, I wish you much joy in your garden and an abundant harvest! 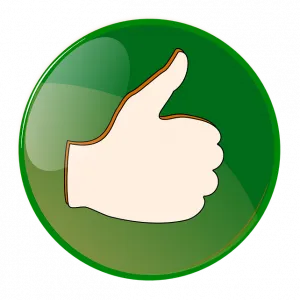 If this page helped you, I would be grateful if you left a comment or a five-star rating. 4.7 (93.33%) 6 votes - Glad you are here.